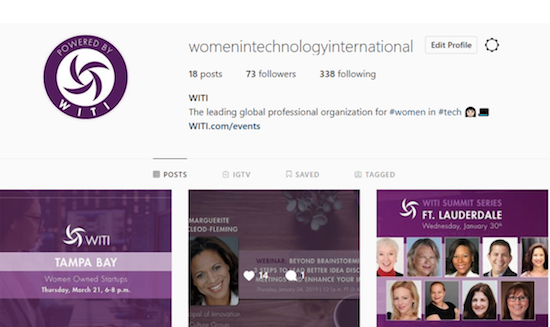 If you're on Instagram, you can now follow WITI (Women in Technology International) for daily updates on events, webinars, and other relevant information. Our handle is @womenintechnologyinternational, and we post about once a day. If you are not on Instagram, you may want to consider creating a profile to not only stay up-to-date on what other companies are doing but also to build your personal brand. With the right filtering, colors, and captions, you can use Instagram to establish yourself publicly as whoever you want your peers and colleagues to see, whether that person is an entrepreneur, a writer, a marketer, a speaker, or a CIO. The possibilities are endless. Additionally, WITI is on Twitter, Facebook, and LinkedIn, and our social media team works hard to post interesting, relevant content every day. Give us a follow, and if you like, send your article submission ideas to [email protected] for a chance to be promoted across WITI's channels to our thousands of followers.